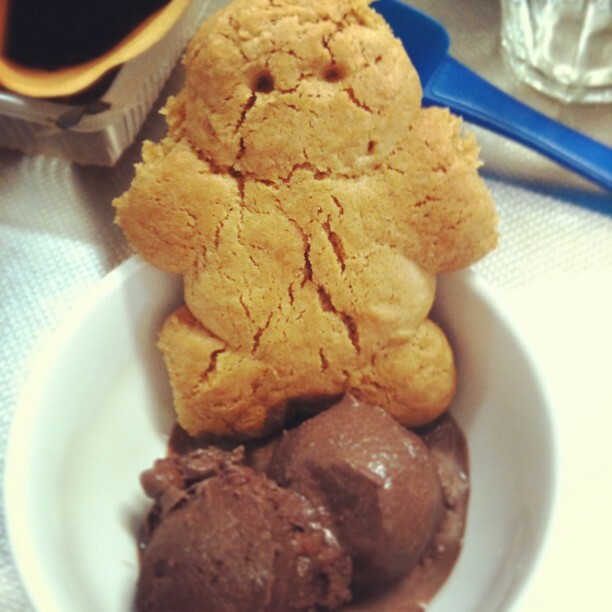 There were lots of sad days but more happy ones and delicious ones too. I hope this past year was a good one for you and I hope that 2013 will bring you much happiness and good health. 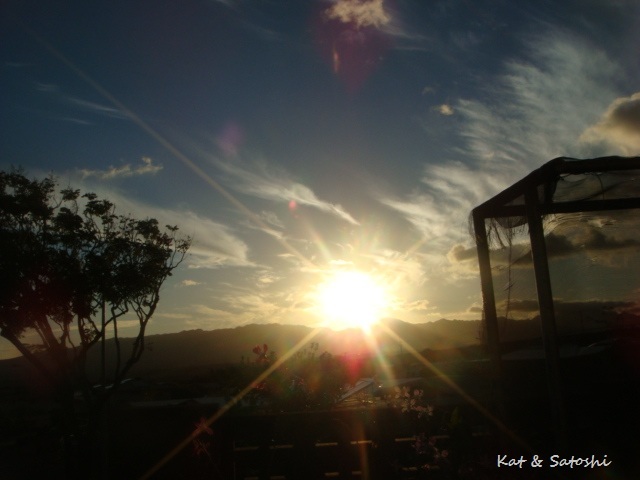 Thank you for reading this blog and talk to you in 2013! 1. Diane Mott Davidson "Double Shot"
2. Dr. Seuss "The Bippolo Seed & other lost stories"
3. 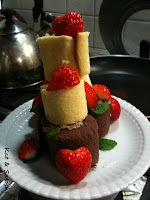 Julia Child "My Life in France"
4. Gyo Fujikawa "Child's Book of Poems"
5. Florent Chavouet "Tokyo Sanpo"
6. Kristina Springer "The Espressologist"
7. Aimee Bender "The Particular Sadness of Lemon Cake"
8. 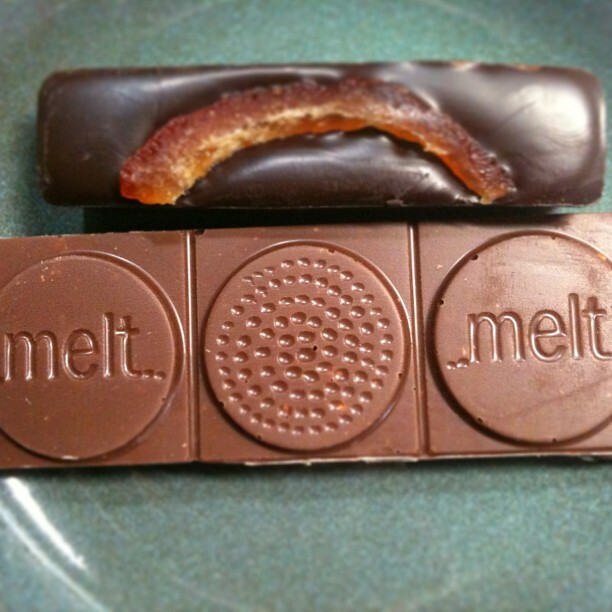 Cathy Lamb "Julia's Chocolates"
9. Hannah Tunnicliffe "The Colour of Tea"
10. Erica Bauermeister "Joy for Beginners"
11. Amy Thomas "Paris My Sweet"
12. Molly Wizenberg "A Homemade Life"
13. 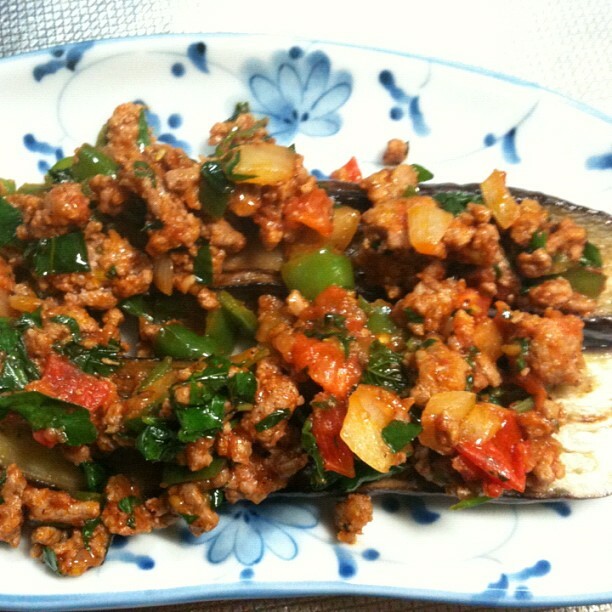 Nicole Mones "The Last Chinese Chef"
Please tell me the titles of books you enjoyed this year. Ninjin shirishiri, this Okinawan dish is simple to make and I also like the version with ra-yu (chili oil) in it. Mango Chutney, despite it being opened by TSA on the ride back from Hawaii, making this was a nice experience. 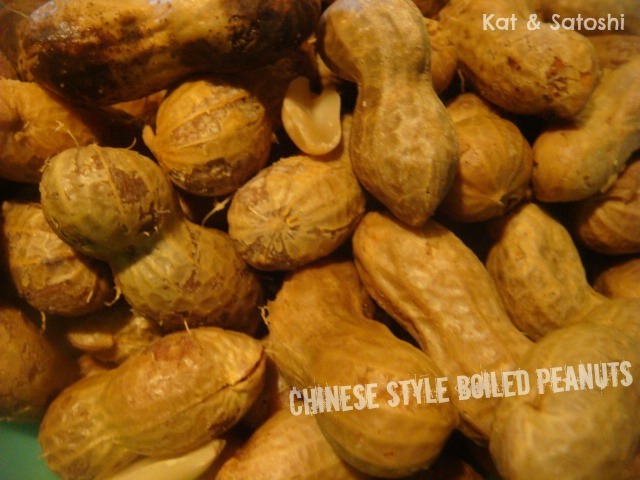 Chinese style Boiled Peanuts. I found out my family likes their boiled peanuts on the raw side, just like me...yummy! 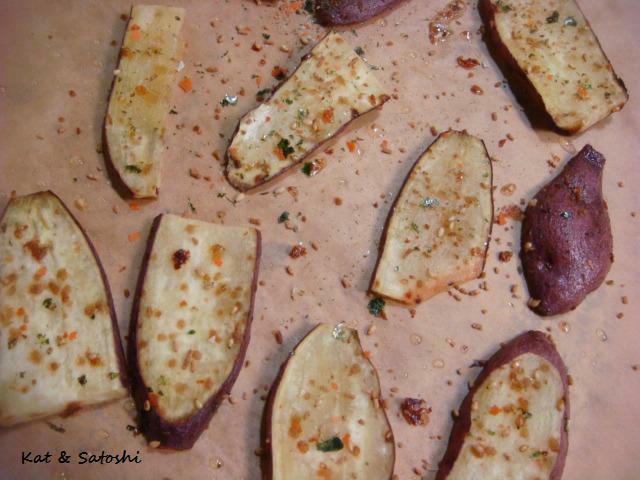 Baked Furikake Sweet Potatoes, a great recipe from the "Peko Peko Charity Cookbook". 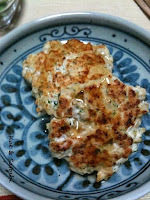 I loved how simple and delicious this dish was, plus the cookbook was a nice way to help the people in Tohoku. 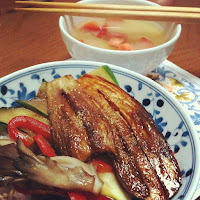 Nasu Kabayaki Donburi a simple and delicous way to get the texture of unagi (eel) without all the calories. Oven Baked Shoyu Chicken, reconnecting with this was delicious! Spice Kaki Jam, it was nice trying something different with kaki (persimmon). Pho Bo, it was fun trying to make this from scratch. Karniyarik, this recipe was easy to put together and really delicious. The stuffing was really nice on warm baguette. Yaki Kuri Gohan, despite all the stress peeling them, this dish was delicious. 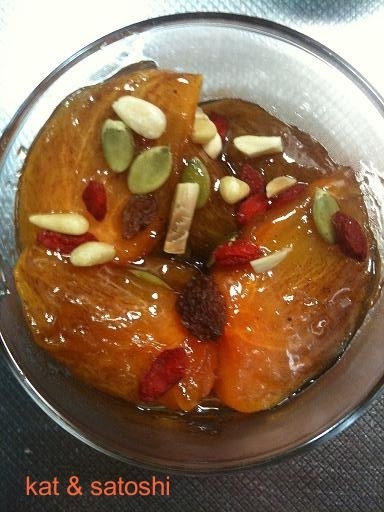 There were a lot of delicious memories this year, I hope 2013 will bring even more new experiences in the kitchen. Got together with Tamakikat for lunch on Christmas Day. The last time we got together in Kyoto, so this time, she was nice enough to come to Osaka. Lunch was at Cante Cante, a relative of Cante Grande. I chose the eggplant curry. 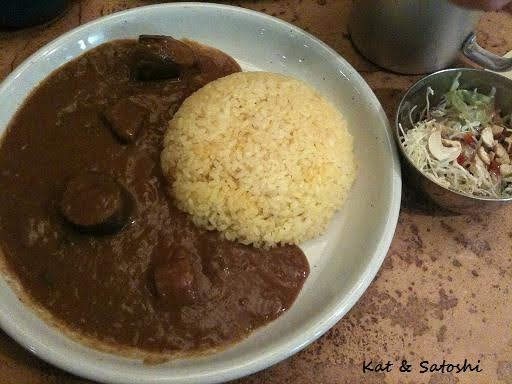 One thing whenever you order curry in Japan, most times there isn't much "stuff", just lots of "sauce". Despite this, their curry was delicious, nice kick to it. 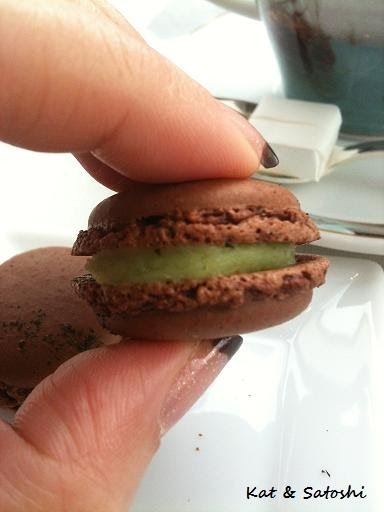 After some shopping, we then had coffee/tea at Cacao Sampaka, I tried their macarons, the outside was chocolate which was chewy like a brownie, and the filling was supposed to be green tea, but it didn't really have much green tea flavor. The weather was overcast, the wind was icy, but it was great getting together with Tamakikat and catching up with her. Most weekdays, you won't find housewives out eating ramen. Nope, they're usually at cafés, lunching with friends or eating alone there. 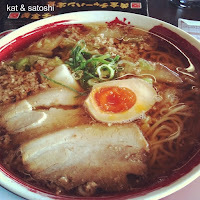 Ramen shops during the weekdays are usually for the "salarymen" (business men), where they can grab a fast meal. Well, yesterday, I was out on my morning walk, there were some flurries, and what I had envisioned having for lunch was then substituted by the craving for something warm, soupy, noodle-y...ramen. The type of ramen I ordered was called "tori-jan" (shoyu based chicken broth)...590 yen. The soup was really nice, a little hint of ginger. I ordered my noodles on the stiffer side, I tend to take a long time eating hot foods, not wanting to burn my tongue, so the stiffer the noodle, the longer I have to eat it without it getting soft and mushy. There was lots of hakusai (chinese cabbage) which was nice. It was my first time to eat by myself at a ramen place and now that I've been "initiated", the next time, I don't think I'll hesitate to go in and have a bowl. How was your Christmas? I hope it was everything you wanted it to be. I didn't get my "white Christmas" and I'm sure Satoshi was happy because he hates the cold...makes you wonder who is from Hawaii, yeah?! 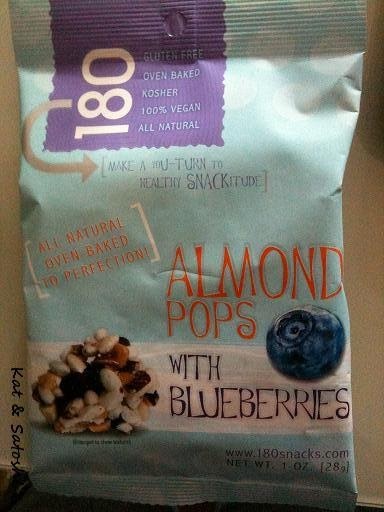 180 snacks, a company from the US, makes these rice puff snacks, which are supposedly only 180 calories. 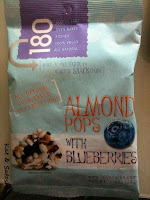 This was delicious, lots of almonds and dried blueberries. 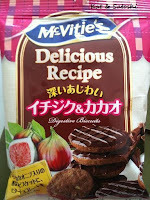 McVitie's digestive biscuits in fig and chocolate. This was really figgy and I think they used dark chocolate...perfect. I've been seeing these "towers" made from small rolled cakes. Not willing to pay the outrageous prices for them since it is Christmas, I decided I would try to "make" my own. 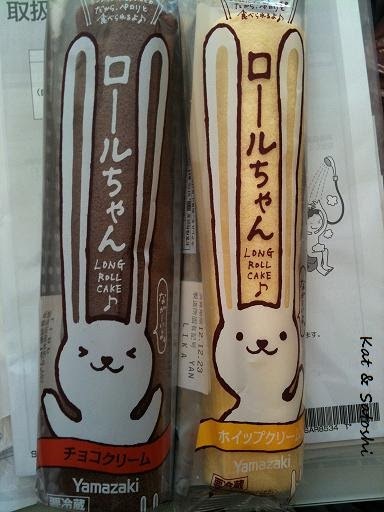 I found these...l-o-n-g rolled cakes in chocolate and whipped cream at the market...only 138 yen each. 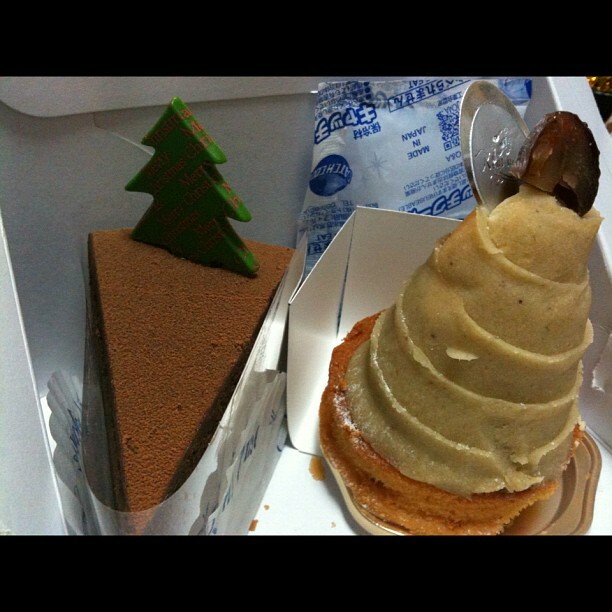 I split the rolls in half and made 1 tree for me and 1 for Satoshi. The trunk of the tree was from 3 pieces from the chocolate cake and the tree was from 3 pieces of the yellow cake. Just split them in half, then remove the leaves. With a knife, cut a "V" where the stem is and you'll have...hearts! Merry Christmas everyone! Hope Santa brings everything you are wishing for. Tsukune is a meatball or patty made from chicken. 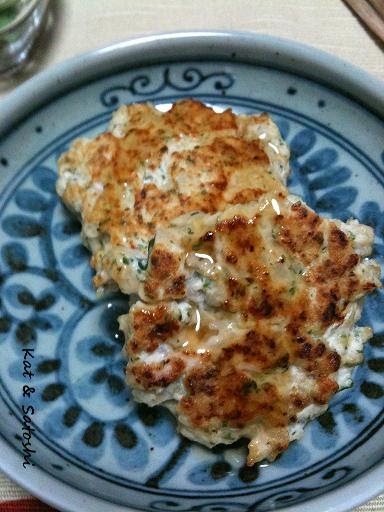 You can find this type of dish at yakitori (grilled chicken) places. Sometimes you can even find them in nabe (hot pots). I recently bought some renkon (lotus root) for another dish so I wanted to use up some of it making this. This is super easy if you have a food processor, if not you have to mince everything kinda fine. Put everything but the egg and oil into the food processor and whizz until everything is minced. If you want to have some crunch from the renkon, I would cut it by hand to get a chunkier consistency. Pour everything from the processor into a bowl and then add the egg and mix until everything is combined well. 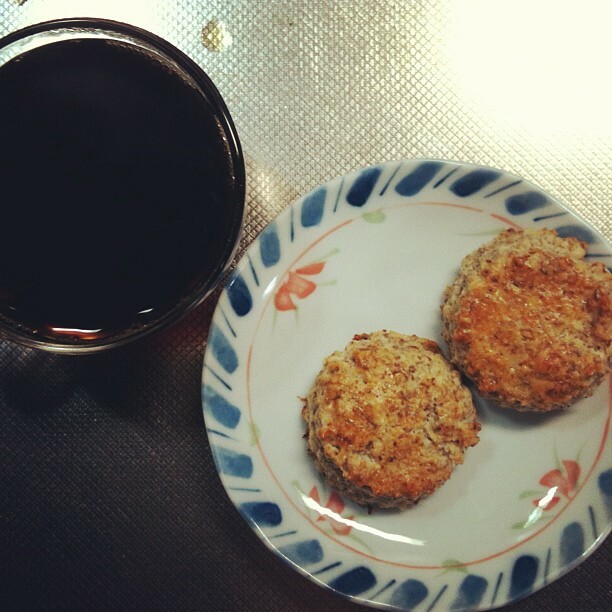 On medium heat, add a little oil to a pan (I used a non-stick pan) and with a spoon, spoon out patties into the pan. This mixture basically has no seasoning, so I served this with a ginger ankake sauce. NOTES: I liked this, it is quite moist and the sauce adds some flavor. 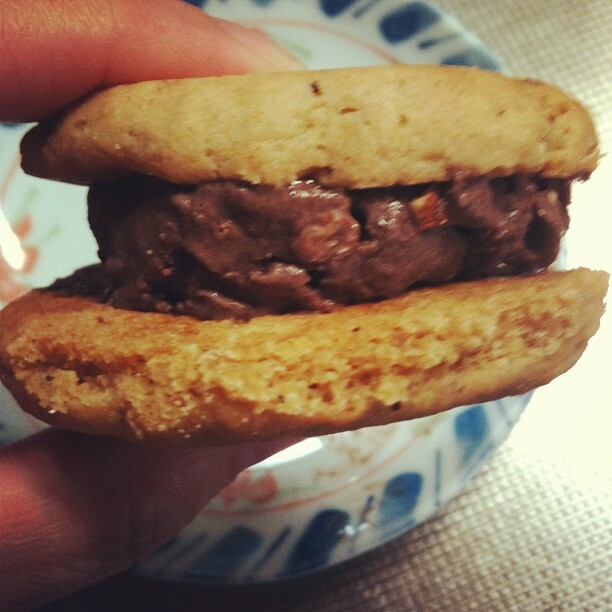 I'm making this again. 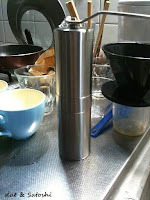 Our electric coffee mill recently went to "coffee heaven". I have a feeling it was because I used to wrap the cord around the mill after using it, so the connection must've gotten wonky. 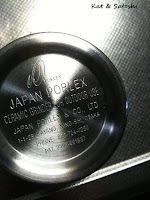 Anyway, I was looking around on the internet for something "made in Japan" and came upon a manual coffee mill made in...Minoo! From what I could tell from their site, they didn't have a mortar and brick store, only online. Since I had to go to Umeda for some other errands, I checked out some places that sell equipment for coffee. I found it at Tokyu Hands. If you've ever visited Japan, you'll know Tokyu Hands has almost anything you're looking for. The handle is removable, take off the cap and put your beans in the top. 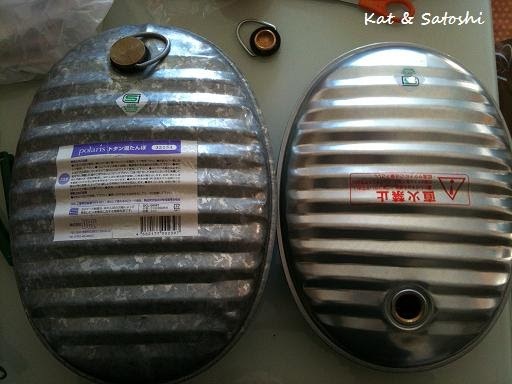 Grind your beans and then open up the bottom canister. The whole thing is washable too. 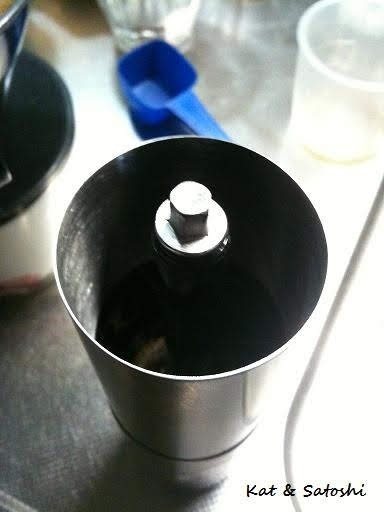 The part that grinds the beans is ceramic, so don't drop it! 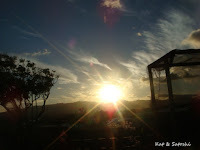 Before I get to today's post, I want to apologize if I'm overloading your RSS feeds, long story short, I deleted something on Flickr and am trying to put the photos I had on many posts back....sorry! 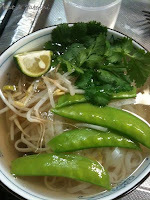 ...The other Saturday, we tried this place that uses Kyoto veggies called Sepporai. You could choose from prix fixe menus or ala carte. We chose to go ala carte. We also ordered a plate with 3 different kinds of sashimi on it. THAT was a rip-off. 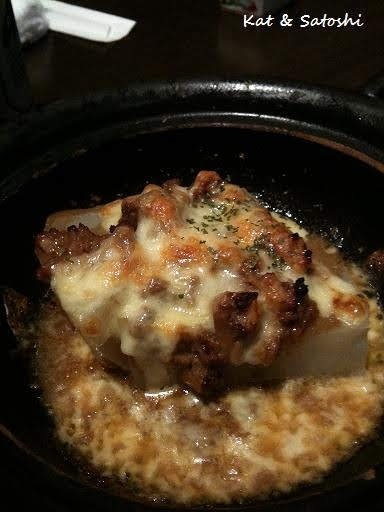 Next came this...daikon topped with nikumiso and cheese. The daikon takes on the flavors of the cheese and nikumiso. Nikumiso is meat, usually pork, sauteed with miso and other seasonings. 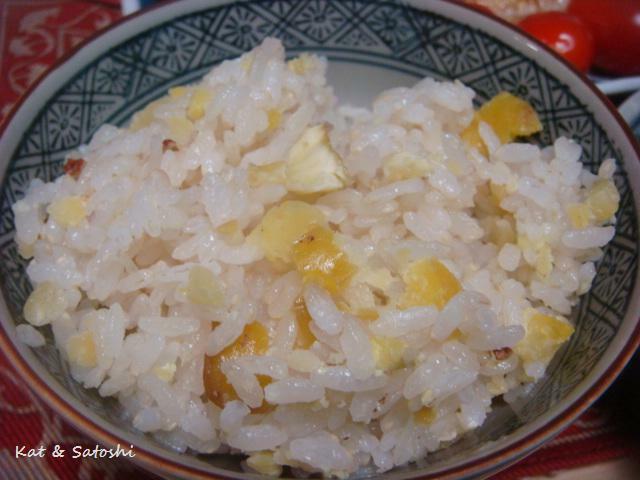 It is a nice topping for rice or in musubi. We also ordered rolled cabbage. 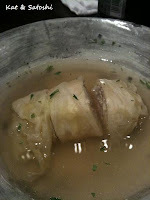 In Japan, most people serve theirs in a consomme soup. This one was really tender. 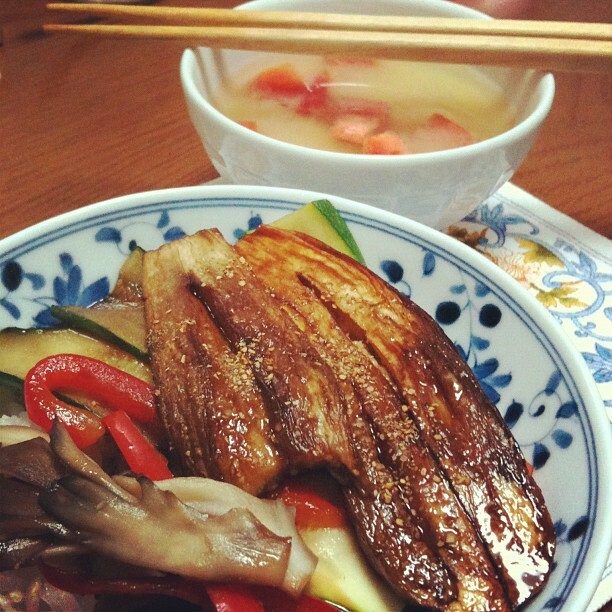 Next came a piece of buri and daikon. 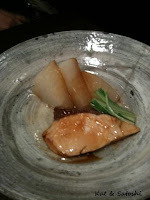 Buri (amberjack) is a popular fish during the winter. 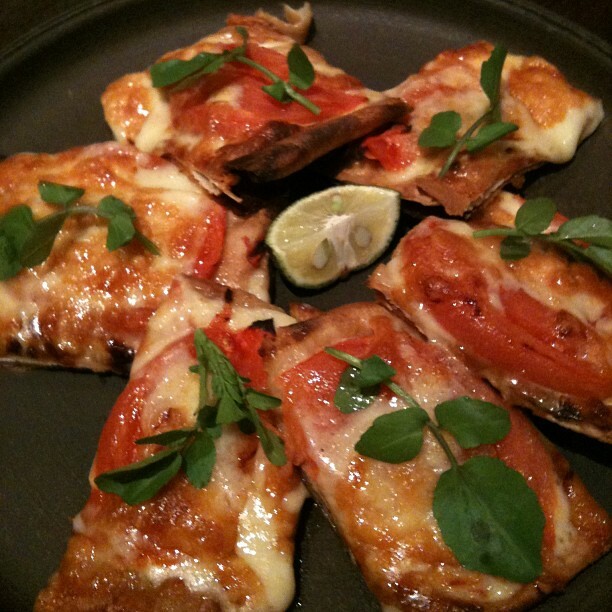 And lastly, we ordered this tomato & fu (wheat gluten) pizza. 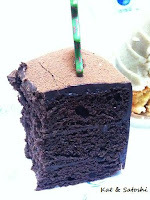 This was different, but we liked how the wheat gluten got really crispy as the "crust". A lot of different foods but all delicious. We'll be back. 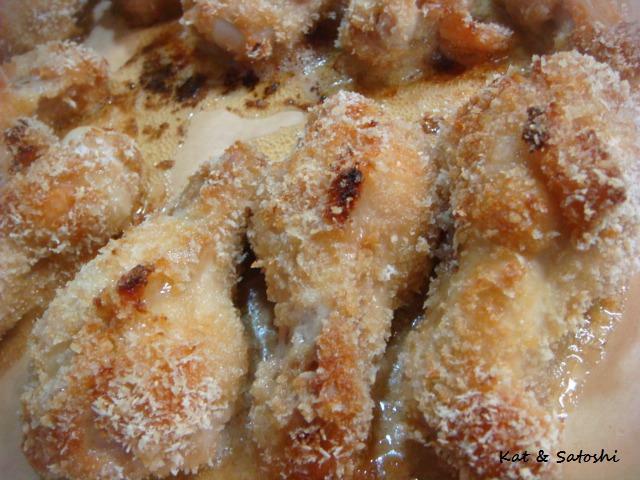 The other day I was looking at a magazine and came across two ideas for pupu (appetizer). 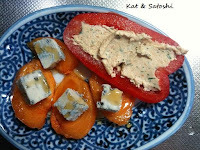 One was kaki (persimmon) with bleu cheese and honey. 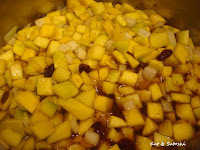 Well, actually the original recipe had an addition of jam, but I thought honey and jam would make things a bit too sweet. 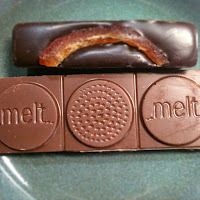 After trying it, the sweet and salty combo is nice but I think you could nix the honey. 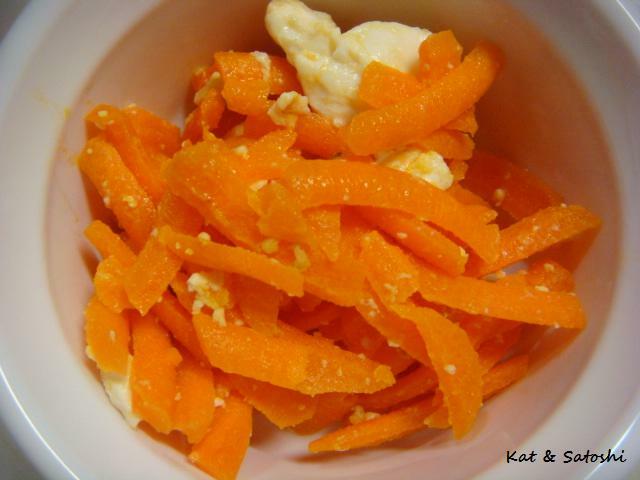 The other was to fill red bell pepper "boats" with your favorite dip--I used smoked salmon dip. I have another smoked salmon dip on this blog here. The recipe I used this time around isn't really a recipe. It uses the food processor and is really fast and simple. In a food processor, put in some smoked salmon, some cream cheese and some italian parsley--the amounts are up to you, if you want it creamier, add more cream cheese, more "salmon-y" add more smoked salmon. 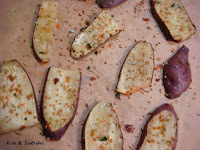 After you whizz it to the consistency of your choice, fill some red bell pepper boats...fun finger food! It's Friday here, I hope your weekend is a nice one. 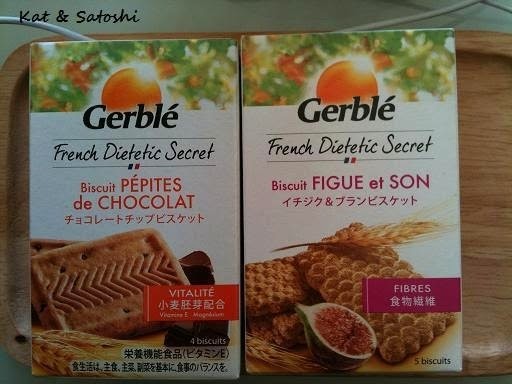 Satoshi went on a business trip last week. 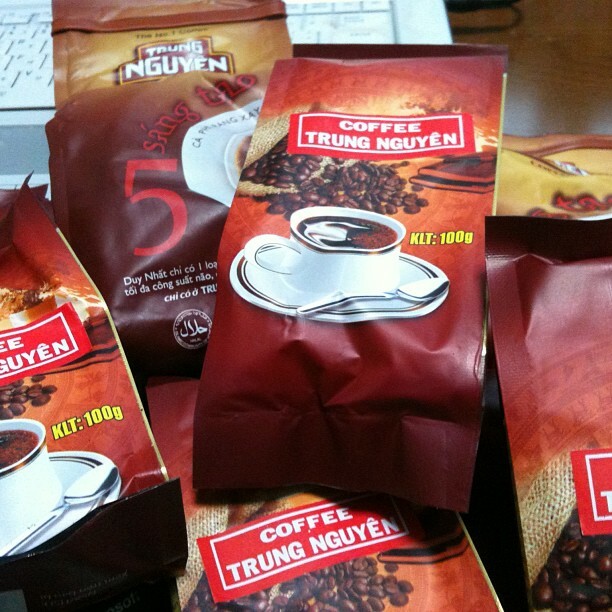 I asked him to buy me Trung Nguyen coffee if he had a chance. They are supposedly the "Starbucks" of Vietnam. Love the internet, lots of ideas and inspiration. One of my Instagram friends posted a picture of a "chinese meat lovers" pizza, the version that was posted had Chinese roast pork, char siu, hoisin sauce chicken, round onion and green onion. I used a pre-made pizza crust. For "sauce" I used hoisin sauce. I cut up 1 lup cheong (Chinese sausage), a piece of char siu, and thinly sliced some yellow onion. I sauteed this in a non-stick pan, to get some of the oil out of the meats and to soften the onion. 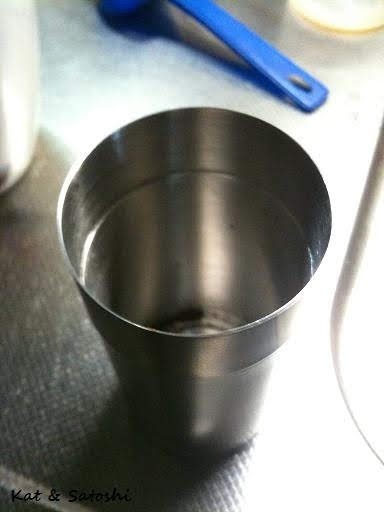 Afterwards, I put the contents onto a paper towel to soak up the oil. 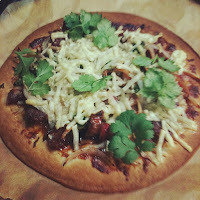 I then put this meat mixture onto the pizza crust with the hoisin sauce and then sprinkled some green onion and cheese. Then I toasted it for about 15 minutes. Before eating, I sprinkled some fresh cilantro. 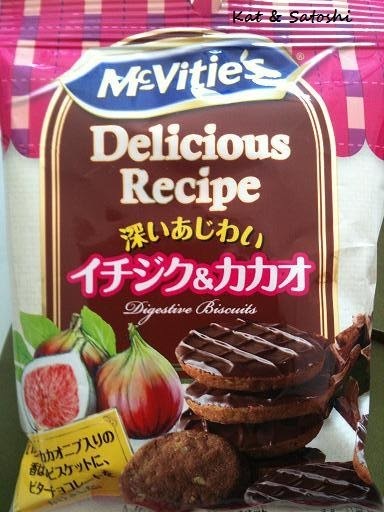 This was delicious, I liked the sweet and salty combo. What have you been eating for dinner? If you look on this blog, there are 31 posts tagged with the word "scone" and even more posts where the word appears within the post. That is a LOT of scones! I recently tried a simple recipe from the Rose Bakery cookbook, "Breakfast Lunch Tea". These scones are not sweet. Perfect with some coffee or tea. Put the first 5 ingredients into a bowl then cut the butter in until you have small crumbs. In a cup, mix the syrup and milk. Mix together until it is combined. 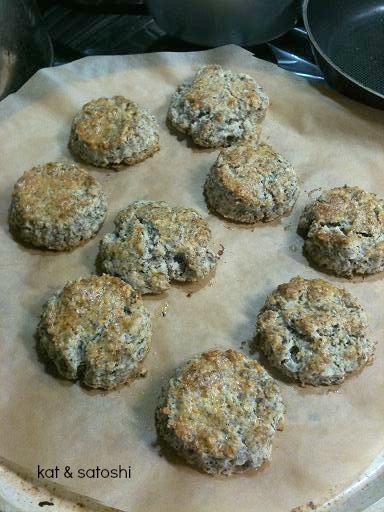 Roll out to about 3 centimeters thick and use a small cutter (2 inch round) to cut out 9 or 10 scones. Glaze with the beaten egg and bake for 20-25 minutes in a 200C (400F) oven. NOTES: With the addition of oatmeal, the texture of these were more like oatcakes. 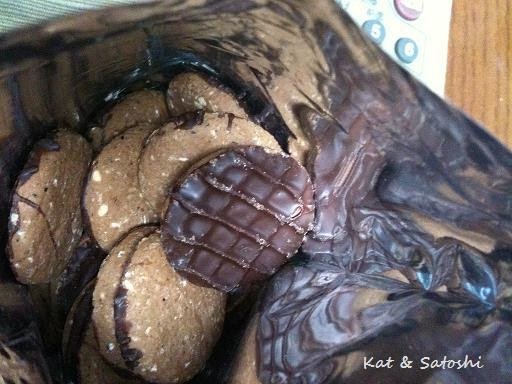 Still, I liked them and would make these again. The other day I had an EGD done. On the last physical I took, they had changed the grade of a stomach polyp, which caused a "red flag" in my charts. So, instead of going back to the clinic that I had the physical at, I went to the hospital that Satoshi is going to, which is why I had to wait so long that last time. It was my first time getting this EGD done (why do doctor's faces light up when they hear it is my first time?!). After checking in, they took me in and gave me a thick cloudy liquid to drink, I think they said this was to slow down the acid in my stomach. Then, they squirt the anesthesia into my mouth and told me to hold it there for 3 minutes before swallowing. They placed a tray near my mouth to catch "stuff" and also covered me with a paper sheet so that my clothing didn't get dirty. The nurse then gave me a shot (I think this was another type of anesthesia) in my right arm and the doctor put a spray of something into my mouth and then shoved a mouthpiece in. Then the procedure began, the hardest part was when they first put the camera into your mouth and try to get the camera past your throat. The nurse was there rubbing my back so that I would "relax", at one point, I tried to grab the doctor to get him to stop, but the nurse grabbed my hand. Then the camera went down, if you want to "watch" your procedure there is that screen on the wall, I chose to keep my eyes closed. From what the doctor was saying, everything looked normal, the polyps (there are apparently more than 1) are quite small in size and apparently nothing to worry about. Also, I'm not sure that they took any samples to test or removed anything. It was about 10 minutes and the whole thing was over, the nurse handed me several tissues to wipe up. My mouth was numb, like when you go to the dentist. Then I had to wait to pay my bill, you need to pay your portion before leaving the hospital. After fasting from 19:00 the night before, they told me not to eat for another hour after the procedure was done because that was how long it took for the anesthesia to wear off. My next appointment to get an explanation of the results will be in January. I have a little cold sore on my lip which I think was from the mouthpiece pressing against my lip during the procedure, but other than that, I'm glad everything went smoothly. 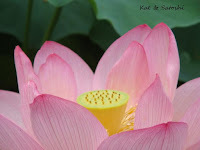 Am stunned and shocked by the tragedies that have been taking place in the US. Someone that has the authority to change the laws on gun control...do it. Sending virtual hugs to everyone. Major failure the other day...I was trying to make gingerbread men, but they poofed. I know part of the problem has to be my cutting the recipe down, but they also didn't have enough spice. 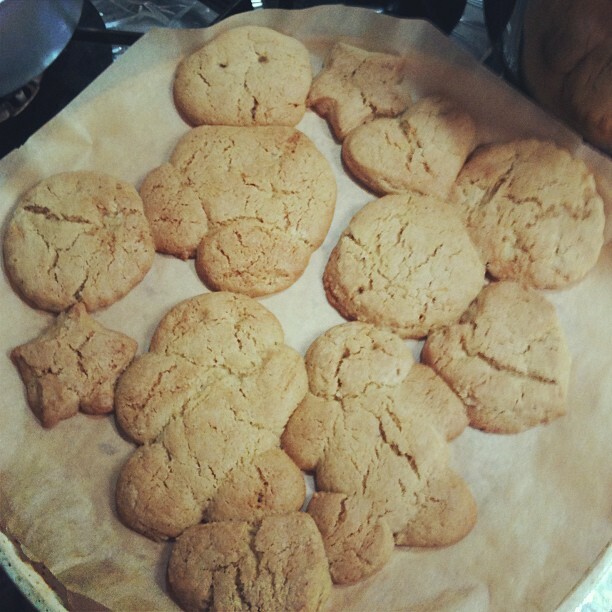 They tasted more like sugar cookies. At least they were a little chewy. Anyway, I had this with some homemade chocolate ice cream. 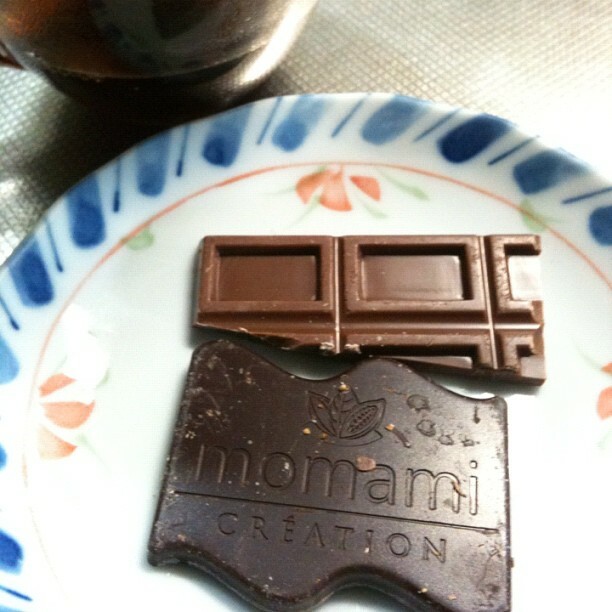 When the weather gets cooler, you can find more chocolates in Japan. 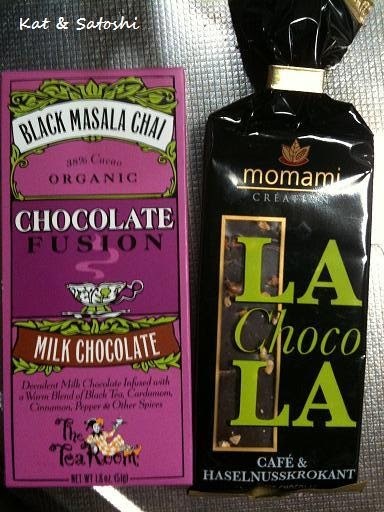 From the US, The Tea Room's Black Masala Chai, a 38% milk chocolate with cinnamon and other spices, I think this one could've been spicier. From Germany, Momami's dark chocolate with coffee & hazelnut, I like how this one was already "broken up", I think this could have had a little more nuts. 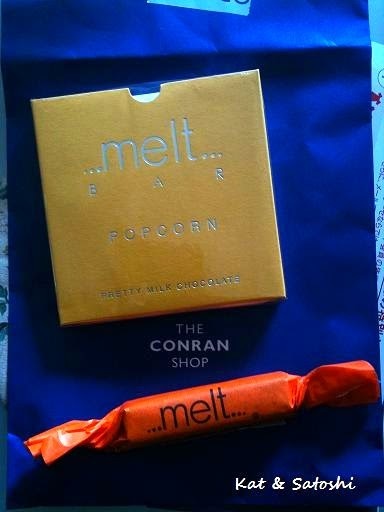 From London, Melt's dark chocolate with orange peel and their milk chocolate with caramelized popcorn. 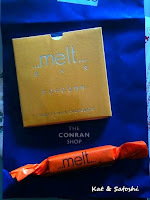 I have had this shop on my list "to try" for awhile now. 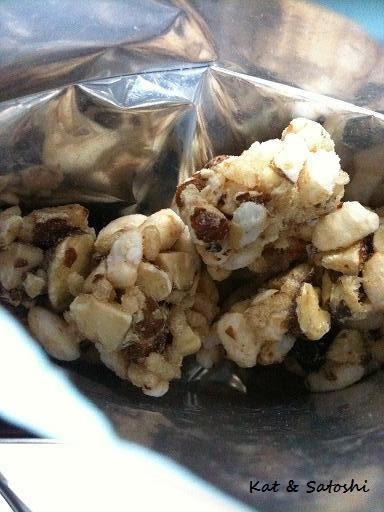 I like the caramel flavor from the popcorn. 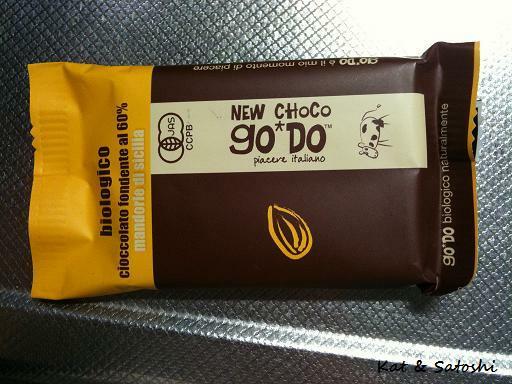 And Go*Do, an Italian organic chocolate. 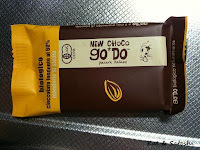 This one was 60% and had Sicilian almonds in it. This one could have also had more nuts. 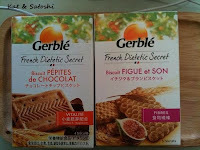 I'm happy I got to try these, all were delicious. It's Friday here, our weather has been very blustery and cold, a lot of areas had snow this past week, but we have been having frost, I hope you have a great weekend. 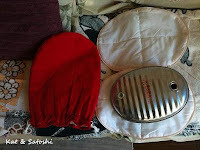 I got a new yutanpo (the one on the right). 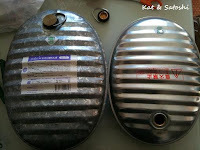 It is a little "slimmer" and smaller than my old one (the one on the left). Both were made in Japan. I like the zip-up case (not made in Japan) for the new one, but still use the red pouch together with the zip-up because the new case is a little thin (don't wanna get burnt!). This time around, I hope this one will last longer. Friday, we had some plumbing problems in our bath area, so we told our building manager and he quickly got someone to call us. Saturday, we were surprised to see two 60-ish year old women...they were at our doorstep to fix our plumbing. 5 minutes later, our drainage was de-clogged and they were on their way. As for the other plumbing problem, which was a non-stop dripping faucet, it needed to be tended to by the maker of our bathtub. Of course, when the two young guys came by on Monday, the faucet "decided" to stop dripping. Still, they said they would need to change the whole system, so that will be done on another day. I really appreciate the quickness of our building manager, and the quickness of the "fixers"...thank you! 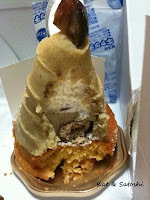 The other night Satoshi brought home some dessert for us from Kent House, one of the new vendors in Hankyu Umeda. Apparently the original shop is located in East Osaka, they also have shops in other department stores as well. 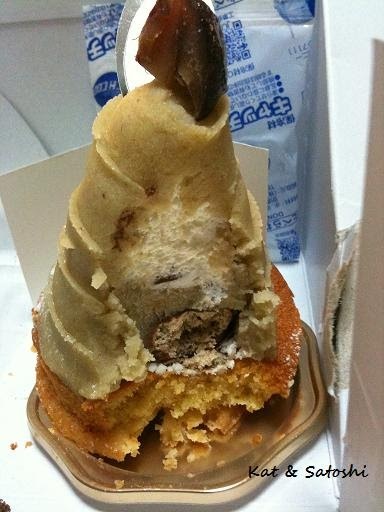 Their mont blanc, was different from the standard kind you find, but there were lots of chestnuts in the middle and it also wasn't too sweet. 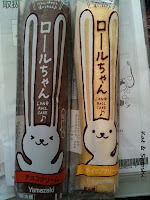 Right now, the food floor is kinda crazy at Hankyu Umeda, since their renewal, so I'm happy we got to try these.